You must be pressured ‘from on high,’ by fate, circumstance, love, or God, because nothing in you wants to believe it, or wants to go through it. Falling upward is a secret of the soul, known not by thinking about it or proving it but only by risking it—at least once. And by allowing yourself to be led—at least once. Those who have allowed it know it is true, but only after the fact. Those words, “no part of you wants to believe it or go through it,” echoed in my mind many times over the past two years. They provided a frame for my experiences, let me know I wasn’t alone. When I had what Rohr describes as a “falling upward” experience (a personal transformation rooted in a life-altering difficulty) I was able to grasp onto the idea that on the other side, there might be a transformation worthy of the darkness I had to encounter along the way. Of course, I couldn’t have known at the time, as no single person in this world can, to where those dark times would lead, and it did, in fact, get very dark. Last winter, I realized my marriage was in serious trouble. I was also in my first year of instructional coaching and was mourning my classroom, my connection with students, and my identity as a “teacher.” In addition, my grandma, with whom I was very close, was sick and likely dying. I did not realize it at the time, but I was also suffering with my first bout of situational depression, which hit me hardest that December. Things did not get better for quite awhile. In the year and a half that followed my marriage almost ended and my grandma left this world while I sat beside her, hands on her body, as she took her last breath. Something did shift within me in all of these difficult months, however, in ways that were unexpected and necessary. I found a deeper love for those with whom I was closest. I found new connections and empathy for others’ who struggled in similar and different ways than me. Most importantly, I found a place of deep silence and peace within myself. Over time that place supplanted the sense of “never-ending search” in which I had spent most of my frantic life. When I look back on the ‘me’ from December.. the me who couldn’t eat or sleep, who had to have someone, my sister, tell me how to live; when I think of the me who would tear myself apart because of others’ negativity, I feel bad for that person. I see how scared, tired, and generally desirous to please, to do right, to love and be loved [that person was]. That person is a part of me, but a part I am hopeful to have helped set at ease. I need to remember how far I have come… I am so grateful to have discovered a deeper part [of my self], a part that can help to heal those places. I know, I hope, I can stay in this… path of unknowing and just live in this patience and inaction within my own strength, my own truth. While leaving the space of who I was for who I would become was difficult, there were things in store for my future I couldn’t see at the time. There was a better marriage, an intriguing career shift, and a more fulfilling life. There were also some of the most awe inspiring, saddening, joyful and utterly human moments I have experienced. Not all will experience post-traumatic growth, but some do; those people all share the same common understanding that a broken thing cannot be put back together and ever be the same- but it can be made into something entirely new. In other words, they are flexible about their perception of the world; they are creative and ever-renewing; they are able to let go of the past and step into the unknown. When I went through my own difficult experiences, I was unfamiliar with the idea of post-traumatic growth. However, the concept resonates with my own life and echoes the words of many scholars, philosophers and artists I deeply respect and look to for guidance. In my own experiences and words, what I most learned along my own path through the darkness was this: The gift of being human comes with the grace of love, and by proxy at times, profound grief and sadness. Loving means feeling the other’s pain. Loving means missing. Loving means losing, sometimes in pieces and sometimes all at once. The gift is worth it, and for more than the joy and fulfillment that comes from loving. From the earth of our deepest sorrows, the richest fruits are harvested. I am interested in hearing and sharing others’ post-traumatic growth narratives, coping mechanisms, and lasting insights. Please feel free to comment on this post or email me via the “Contact” link in the menu with your story. 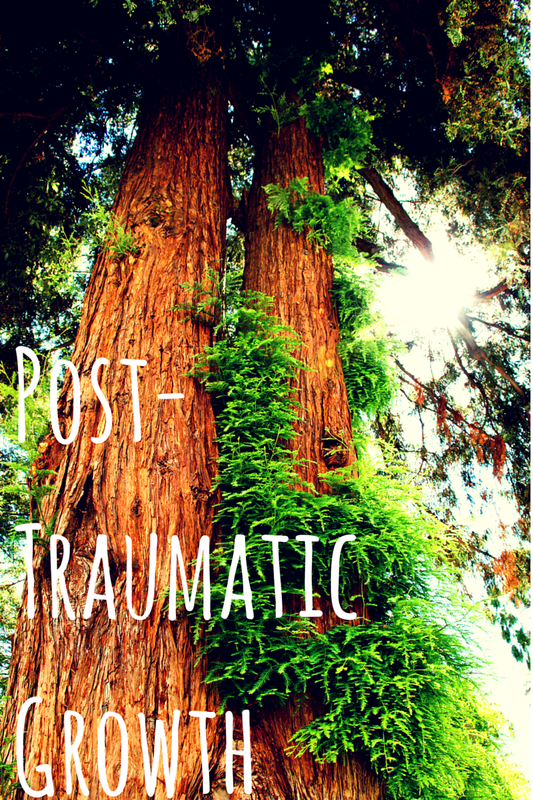 I have done much research on the topic of post-traumatic growth (some of which is used here). Please see the sources below for additional information, including the video of Stacey Kramer’s TEDTalk “The Best Gift I Ever Survived” about her own post-traumatic growth experience. Berry, Makenna. “The Benefits of Adversity Are Very, Very Real.” The Saybrook Forum. Saybrook University. 27 Nov. 2010. Web. 9 Apr. 2015. Crane, Kristine. “How Trauma Can Help You Grow.” US News. U.S. News and World Report. 8 Sept. 2014. Web. 28 Apr. 2015. David, Susan and Christina Congleton. “Emotional Agility.” Harvard BusinessReview. Harvard Business School Publishing. Nov. 2013. Web. 28 Apr. 2015. Kramer, Stacey. “The Best Gift I Ever Survived.” TED. Feb. 2010. Web. 28 Apr. 2015. Landro, Laura. “Study Finds Adversity Makes Us Stronger.” The Wall Street Journal. The Wall Street Journal. 18 Oct. 2010. Web. 28 Apr. 2015. “Post-Traumatic Growth and Building Resilience.” Harvard Business Review. Harvard Business School Publishing. 2015. Web. 28 Apr. 2015. Rendon, Jim. “Post-Traumatic Stress’s Surprising Flip Side.” The New York Times. The New York Times Company. 22 Mar. 2012. Web. 28 Apr. 2015. Rodriguez, Tori. “Negative Emotions are Key to Well-Being.” Scientific American. 11 Apr. 2013. Web. 28 Apr. 2015. Rosenthal, Norman. “The Gift of Adversity.” Huffington Post. Huff Post Healthy Living. 20 Aug. 2013. Web. 28 Apr. 2015. Steven, Joseph. “What Doesn’t Kill Us: Post-traumatic Growth.” Huff Post TED Weekends. Huffington Post. 14 Mar. 2013. Web. 28 Apr. 2015. “What is PTG?” Post Traumatic Growth Research Group. The University of North Carolina at Charlotte. 2013. Web. 28 Apr. 2015.